I am still here! I have had to take a break between selling our house and being pregnant, but I’m back! The recipe I have today is totally worth the wait! Fried ice cream is a fantastic mix of vanilla ice cream mixed with Cool Whip and cinnamon layered with a sweet, fried Corn Flake mixture. Together, they create perfection. This recipe came to me through a friend of a friend who brought this to a party. It is soooooooooooo yum!!!!! This recipe you make ahead for a crowd, making it ideal for parties. And I also figured out how to scale it down for a more manageable quantity. I brought the huge version to a chili cook-off and it was almost all gone by the end of the night. Then I made the smaller version for a dinner party (5 adults, 2 kids) and there was none left. It is popular. And regardless of which one you go with, it really doesn’t take too much to make it. You spend more time waiting for the ice cream to get melty than anything else. 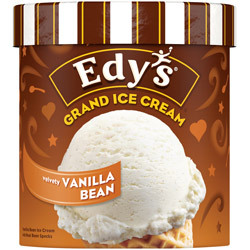 The party-sized version uses a big bucket of ice cream. The upside is that if you are planning on taking this to a party and are torn about leaving the rest of it for your hostess and keeping some for yourself, you get to do both! The final product takes up 1 ice cream bucket plus 1 cool whip container. So everyone wins! 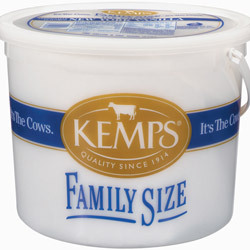 The smaller version uses a 1.5 quart container of ice cream, which you can put into a ton of different containers around your kitchen. Just make sure they are freezer-safe. 1 gallon of vanilla ice cream, thawed to a workable consistency. The big one from your childhood. Thaw the ice cream and cool whip ahead of time. You need to be able to get a mixer in there. Melt the butter in a saute pan over medium heat. Mix in the sugar to combine and then add in the corn flakes. When the corn flakes start to look a little darker, turn the heat off and continue to stir them occasionally while they cool. 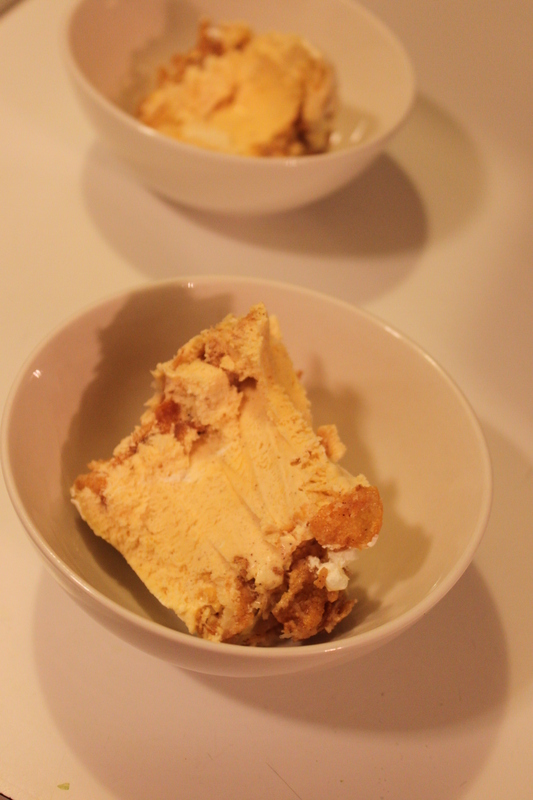 While the Corn Flakes cool a little bit (and don’t stress over how much, a few minutes is fine), work on the ice cream. If you are doing the party-sized version, you’ll want to get a huge bowl and split the ice cream between the original container and the big bowl. I used an enormous salad bowl. Eyeball about the right ratios of Cool Whip and cinnamon into each container. Again, no stressing over this. Just guess. 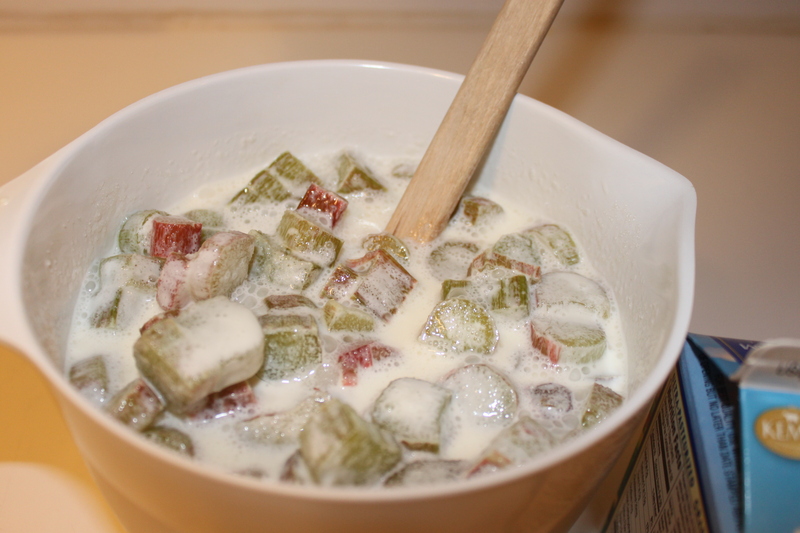 Using a mixer, mix up each one until combined. 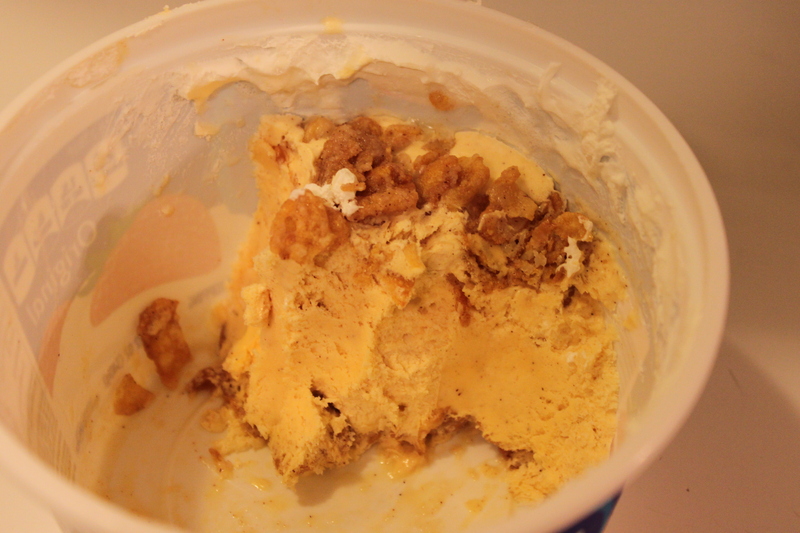 Layer the Corn Flakes and the ice cream mixture in the ice cream bucket. This might mean dumping everything in your other bowl for a minute. I do about 3 layers of Corn Flakes in one bucket, if that helps. And try to end with Corn Flakes so people at the party know it isn’t just ice cream. But do what feels best for you. 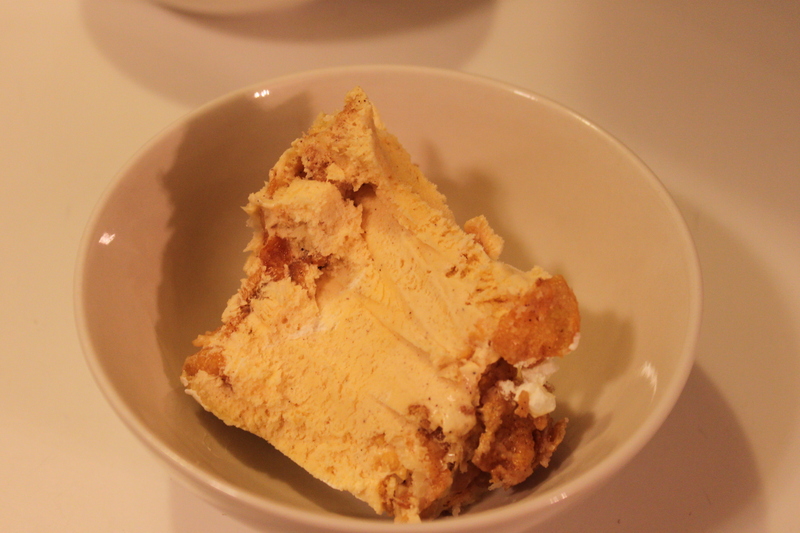 With the remaining Corn Flakes and ice cream, layer them in one of the Cool Whip containers. Put everything in the freezer overnight. Take the big one to the party and know you have the small one at home for you. In a large mixing bowl, add ice cream, Cool Whip and cinnamon. Using a mixer, combine well. In a freezer-safe bowl or dish, layer the Corn Flakes and ice cream. I end with Corn Flakes so it looks nice. Cover and put in the freezer overnight. You will be amazed at how quickly this disappears! Before going in the oven. The butter and the batter don’t mix. Then add the peaches and top with sugar. 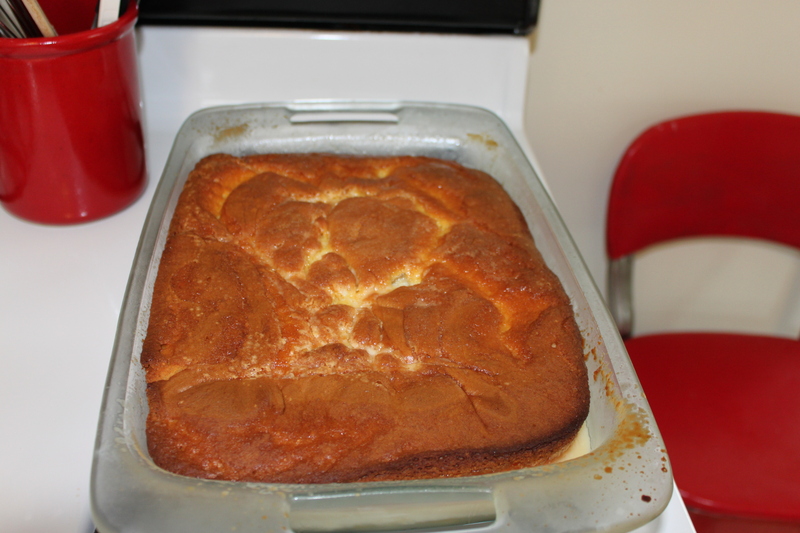 I forgot to take a picture when it came out of the oven. Peaches are IN SEASON! Get them. Get lots of them. They are soo good!!! And they don’t last, so you really have to move fast when they’re good. Today’s recipe is from my mom. It was written on a little piece of paper with very few instructions, like all good recipes should be. Cobbler is a little misleading since there isn’t any brown sugar with flour/oatmeal concoction on the top. So don’t get psyched for something like that. 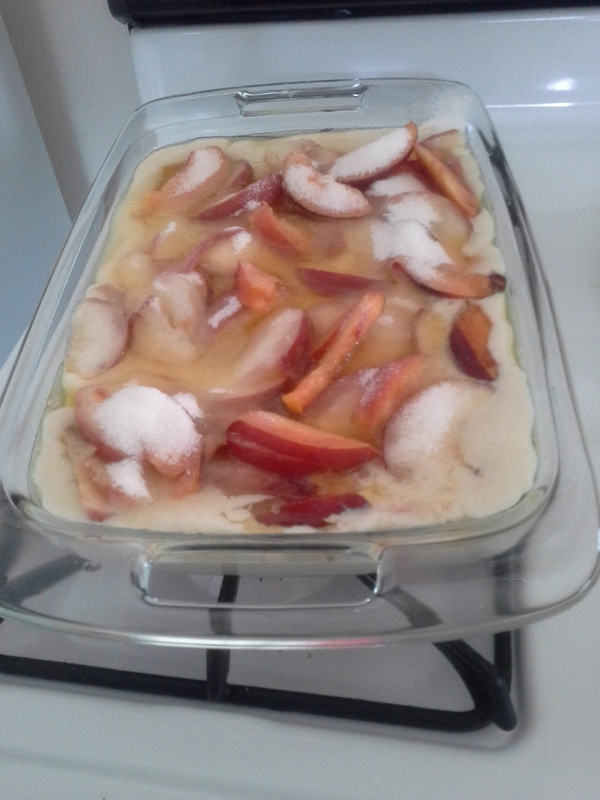 This is more peaches in a baked bar/custard with carmelized sugar on top. Delish! I made a double recipe for tailgating a couple of weeks ago and even though I didn’t really cook it all the way through, it was still pretty popular. Did I mention this is super easy? There are so few ingredients that you’ll spend more time slicing up the peaches than anything else. Doubling: you can double this recipe easily. Use a 13×9 to bake it in, but make sure you put down a rimmed sheet on the rack below the 13×9. Once I put the whole thing in the oven, the butter heated up and spilled over the edge making for some smokey cooking around here lately. Make ahead: this is great to make ahead. You can even reheat if you feel like it. Store it in the fridge. Preheat the oven to 350 degrees. 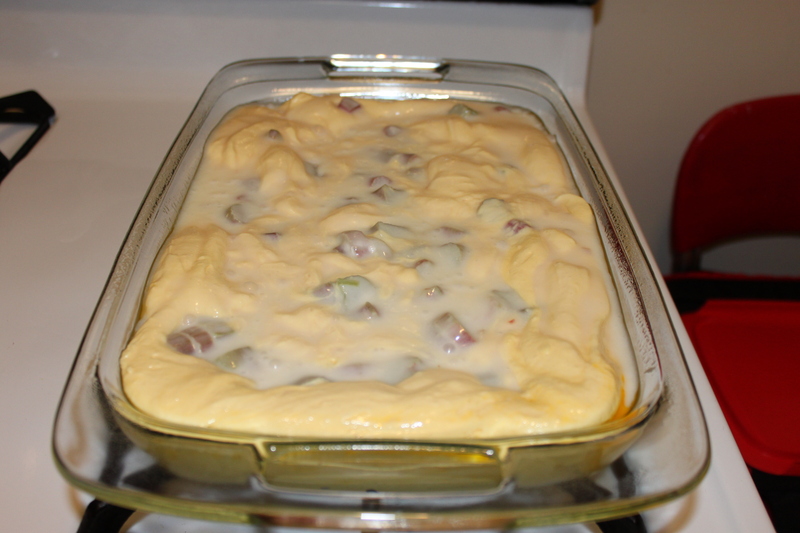 Put the butter in a 3-quart baking dish (9×9), put in the oven until melted, about 5 minutes. Whisk together 3/4 c sugar and the rest of the dry ingredients. Whisk in the milk. Pour the batter into the butter. DO NOT MIX. Arrange the peaches on top of the batter. Sprinkle the remaining 1/4 c sugar. Bake for 35-40 min until the middle is set. 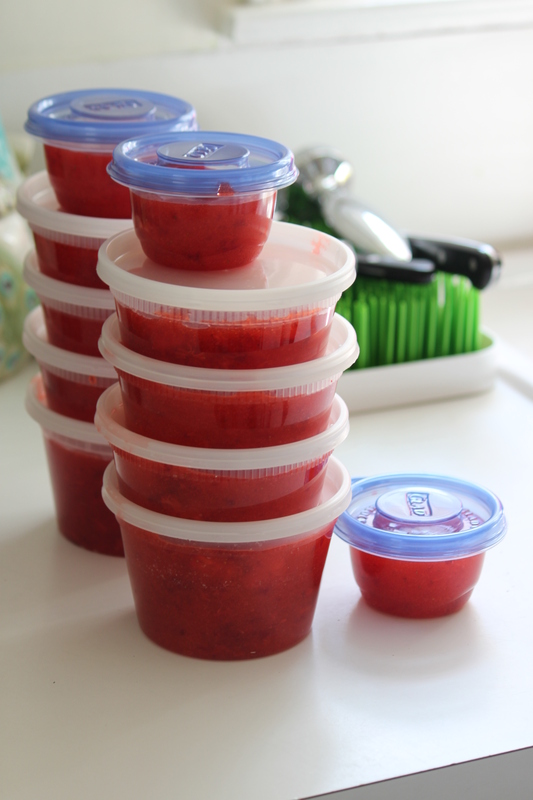 Freezer jam is easy and yummy! Here is strawberry jam. We already finished our peach jam from last year and I need to make more this year. BTW, this is a double-recipe shown. If you are loving peaches and want to enjoy them all year long, pick up some pectin and small storage containers. Don’t be fooled, the picture is of my strawberry jam, which is also super yum. Follow the directions in the pectin for peach freezer jam. It is fantastic! Just water, sugar, peaches and pectin, you know there isn’t anything extra in there that you don’t want. The directions are easy – boiling some water, cutting up from fruit, mixing everything together, then putting the jam into containers on your counter for 24 hours, then voila – jam! There is nothing like pulling out a little bit of homemade jam in the middle of the winter to make you feel better.